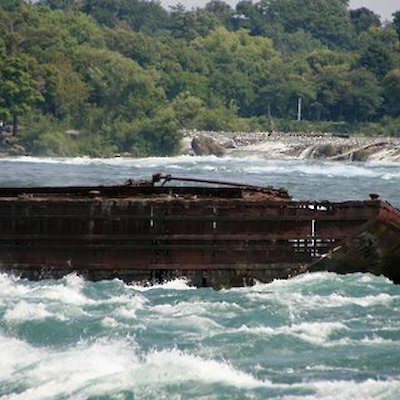 That old barge has been stuck in the upper Niagara River since August 6th, 1918.Having weathered fierce winter storm over the past 96 years it doesn’t look like it will ever dislodge and go over the falls. Instead, it appears to be rusting away. The steel bottomed sand scow was doing dredging operations in the fast currents on the American side of the river near the entrance to the Niagara Falls Power Company hydraulic canal. The scow was being towed by a tug with two decks hands on board. During dredging the tug struck a sandbar approximately one-half mile upriver from the falls. The towline snapped like an elastic and the scow, with the two men on board, quickly drifted down river. 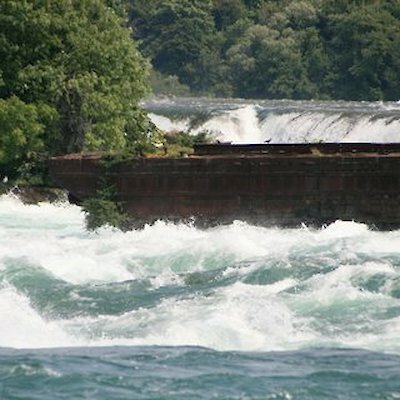 Miraculously the scow became embedded on a rock shoal about 767 metres above the falls. Heroic efforts over the next 16 hours resulted in the slow rescue of the two men via a breeches buoy line that was shot out over the river from the roof of the Toronto Power Plant that stood opposite where the scow had become stranded. Remember, no helicopters in 1918. Except for a bit of wear and tear both men were unharmed.